Description: Family, Friends, and Faith is an inspirational memoir of how one woman made a difference in thousands of lives. An Inspirational Life: Sister Barbara Eppich O.S.U. 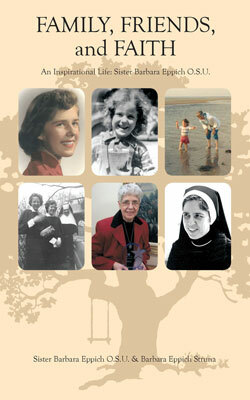 Born Nancy Rosemary Eppich, she entered the Ursuline Sisters of Cleveland in 1954. Now in her early eighties, she relives the challenges she encountered within the confines of the paternalistic Catholic Church. She recalls that without the kindness of the Ursulines, she could not have experienced the pure joy of teaching so many young children, who in their simple ways, made her laugh, and oftentimes taught her life lessons. This is the story of an ordinary person who has done extraordinary things.